Chart of the Week: Interest in cryptocurrency continue to grow as over 460 crypto investment funds have been recorded. The chart above reflects the world as we know it – at least regarding institutional investors and cryptocurrencies. According to Crypto Research Fund, there are more than 460 crypto investment funds. That number includes hedge funds, venture capital funds, and a few ETFs and private equity funds. The distribution of these funds is interesting. Currently, the bulk of the funds have less than $50 million in assets under management (AUM). And funds with fewer than $10 million AUM make up more than 40% of the market. That’s pocket change for traditional hedge funds. And that’s why we’re so excited about the building institutional boom in crypto. 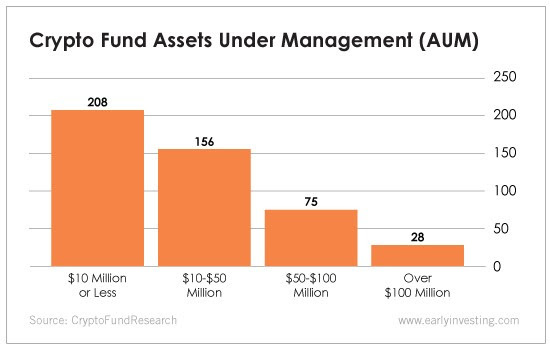 Imagine a world where this chart is reversed – a world where 208 funds have more than $100 million AUM and just 28 have fewer than $10 million in AUM. That’s billions of dollars injected into the crypto markets. And that’s the world we’re headed toward – only bigger. According to Crypto Research Fund, in January of 2016, crypto funds had $190 million AUM. As of July of this year, that number is at $7.1 billion. And that growth happened in the absence of regulations, tried-and-true custody solutions and ETFs, which are generally prerequisites for institutional investors to join the market. But that’s changing. The parent company of the New York Stock Exchange (Intercontinental Exchange) is building a cryptocurrency trading platform that includes a custody solution. We’re moving closer to the approval of a bitcoin ETF. It’s a matter of when, not if. Coinbase launched a custody solution for institutional investors earlier this year. Like I said, it’s when, not if. There’s a wave of institutional money getting ready to flood the crypto markets. Don’t miss your chance to buy into the market early. This chart is just a hint of what the future holds.